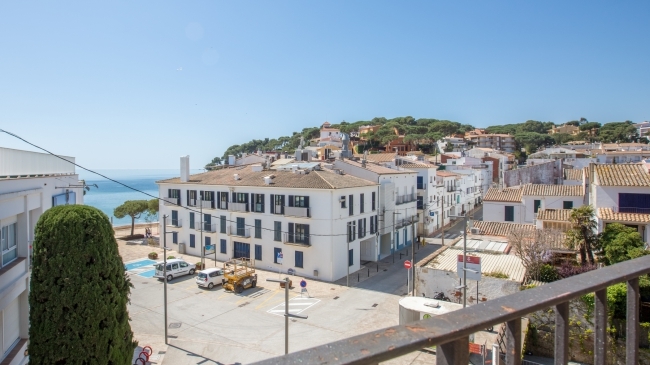 Beautiful renovated ground floor apartment of modern style located in Calella de Palafrugell, 350m from the beach and 400m from the center. 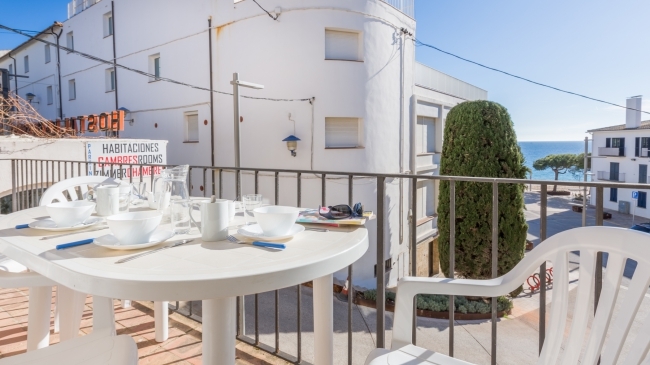 It has 2 bedrooms (1 with double bed (150x200cm) + 1 bedroom with bunk beds and a trundle bed (90x190cm)), living room (TV, Wifi) with access to a furnished terrace and overlooking the communal pool, kitchen (induction ceramic hob, oven, microwave, dishwasher), laundry (washing machine, dryer), 1 bathroom with shower + 1 toilet. Optional heating (30€/ week). Garage. 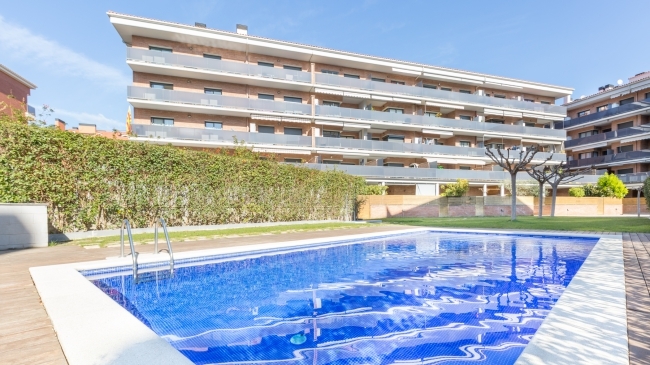 Basic apartment located in a beautiful residential area with communal gardens and pool in Calella de Palafrugell only 500m from the beach and the city center. It has 2 double bedrooms (1 double bed (135 x 190) and 2 single beds (90x190)), a simply equipped kitchen (oven, microwave, fridge), living - dining room (TV, sofa bed), 1 full bathroom with shower. 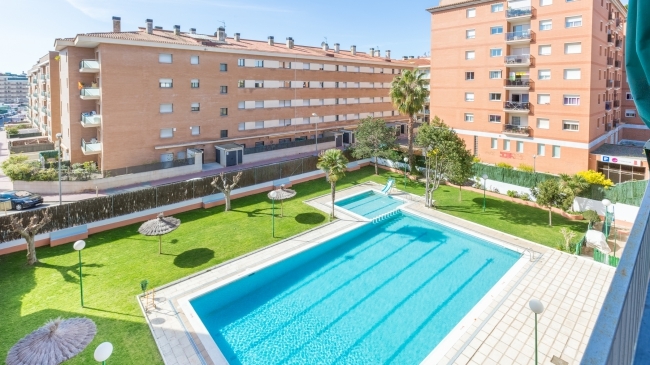 Possibility to rent a ground floor (with small terrace and direct exit to the garden and pool), 1st or 2nd floor (subject to availability). Community outdoor parking and wifi access included. Community washing machine (cost not included). 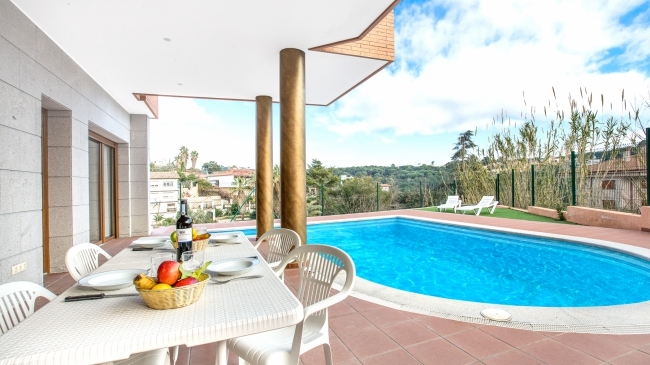 Villa Dama is a beautiful house (120m2+1700m2 of plot), divided into 2 independent apartments. 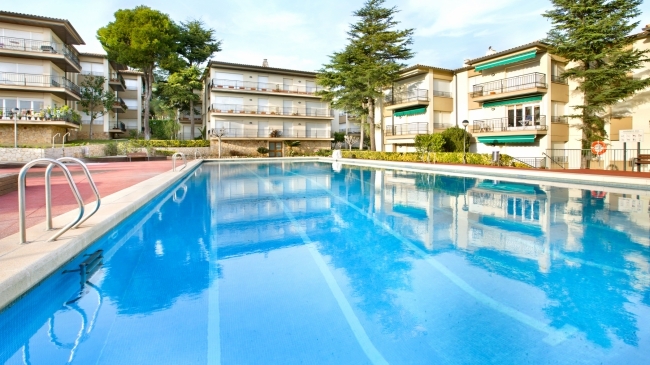 It is placed in a quiet residential area of Lloret de Mar(Lloret Verd), 10Km from the beach and 8Km from the village centre. In the upstairs apartment there is a big dining room(TV), a fully equipped kitchen(dishwasher, washing machine, microwave), 2 double rooms (double beds of 135x190cm) and a bathroom with a shower. A big terrace where you can enjoy of nice views to the mountain. The apartment below, has a big dining room(TV, fireplace), open to a fully equipped kitchen (microwave, washing machine)), 1 double room (135x190cm) and 1 triple room (1 single bed + bunk beds 90x190cm) Bathroom with a shower. 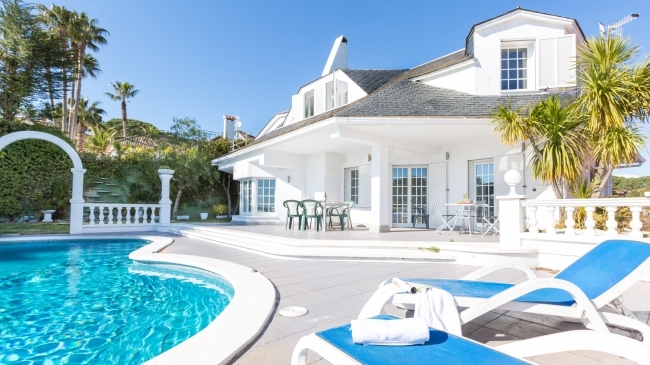 A cozy exterior area, with wonderful grounds, swimming pool and barbecue. Parking. 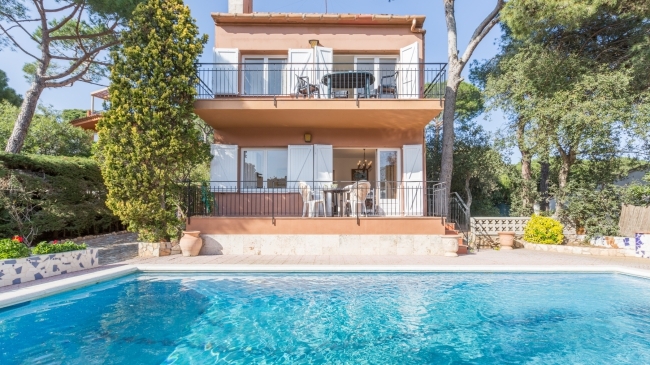 Villa of 110 m2 (+ 900 m2 of land) located 1.5 km from the beach (Cala Canyelles) and 8 km from the center of Tossa de Mar. 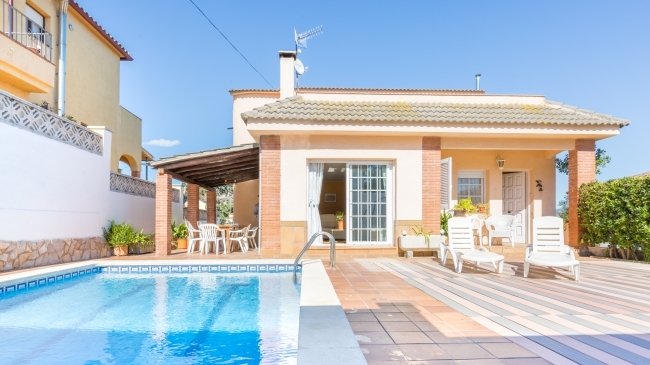 3 double bedrooms (1 double bed (135x190cm) and 4 single beds (90x190cm), living-dining room (TV), kitchen (dishwasher, microwave), washing machine, 2 bathrooms (one with shower and the other with bath), private pool (7x4m), terraces. 2 cars. The pictures of the beach do not correspond to the view from the house. They are of Cala Canyelles, the closest beach to the villa. Cala Canyelles is a pretty stretch of the Costa Brava's coast with 500m of the characteristic coarse white sand beach of the area. Umbrellas and deck chairs are available to rent as well as activities like pedal boats, parasailing, water- skiing and canoeing. Also you can taste the Mediterranean food, fish and paellas, in the restaurant placed on the beach. 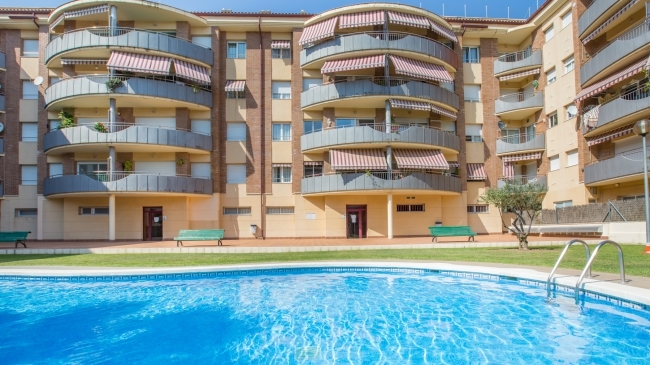 60m2 apartment located in Lloret de Mar, in the area of Fenals, a 300m from the beach and 400m from the centre. It has 1 twin bedroom (2 single beds of 90x190cm), a living-room (TV; sofa-bed double 130x180cm), a kitchen (microwave, washing machine, vitroceramic cooktop), 1 bathroom with a shower. Terrace. In a complex with a shared pool and garden. 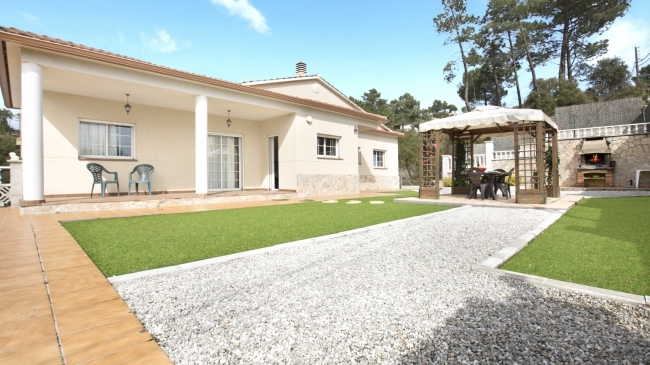 It has a private garage, air conditioning and heat pump, all of which is optional, and with an extra cost of 30 €/semana. 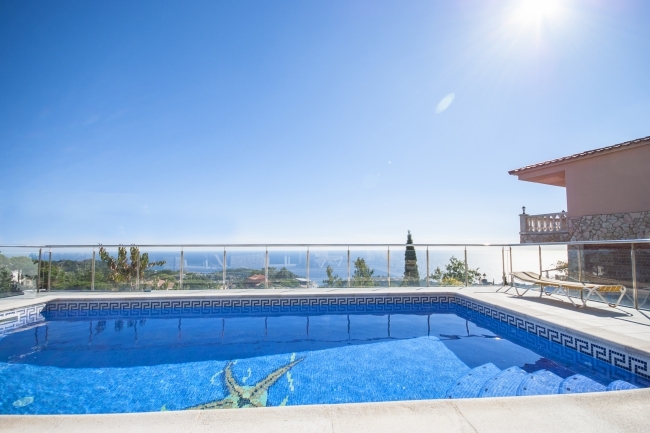 Simple and semi-refurbished apartment located in Llafranc on the second line of the sea. Second floor without elevator. 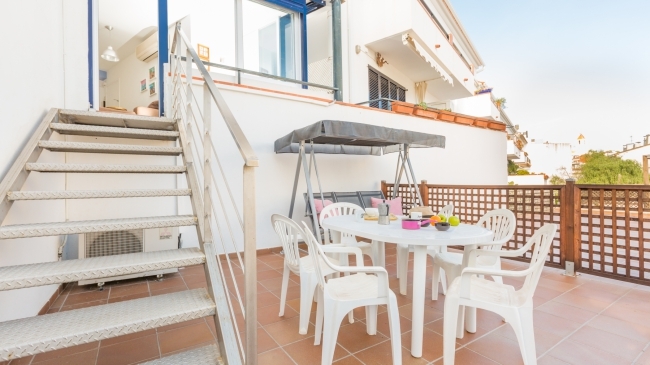 3 double rooms (6 single beds (90x190cm), 2 bathrooms with shower, kitchen (ceramic hob, microwave, dishwasher) with pantry and laundry area (washing machine) and living room (TV) with terrace and sea views. 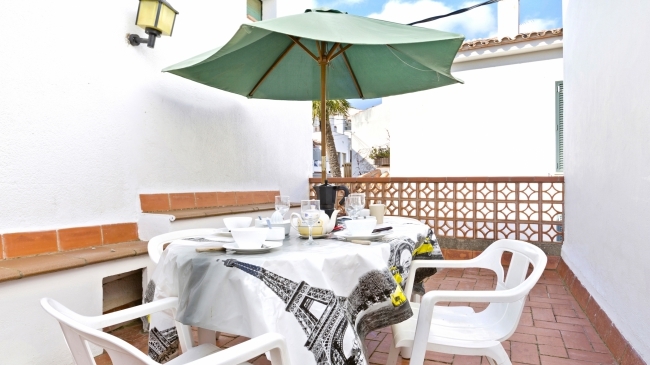 Small and basic traditional style house located just 50m from the beach and center of Llafranc. It consists of 2 double bedrooms (both with 2 single beds (2 of 90x190cm and 2 of 120x180cm), 2 complete bathrooms with shower, living-room (TV), kitchen (ceramic hob, oven, microwave, and washing machine), terrace with outdoor furniture and garage. 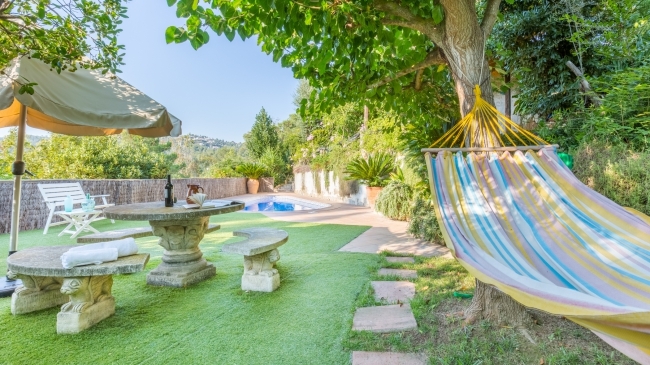 Simple house of 80 m2 (+ 800 m2 of land) located in Lloret de Mar, 9 km from the beach and the center, in the quiet residential area of Aiguaviva Park. 3 double bedrooms (1 with double bed (135x180cm), 2 with 2 single beds each (80x180cm)), dining-living room (TV), kitchen (microwave, washing machine, dishwasher), 2 bathrooms (1 with bath and the other with shower). Swimming pool (8.5 x 4.5 m). Barbecue. Garage (2 cars). Mountain view. Supervised by a guard from the apartment annex. 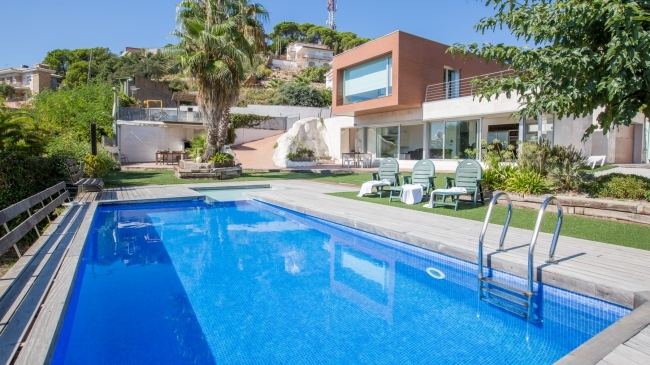 Villa Cristina is a beautiful house and modernist design located in the residencial area of Roca Grossa on a plot of 1034m2 with fabulous sea views, at 4.5Km from the center of Tossa de Mar (2.5 Km from the center of Lloret de Mar). The built area of 385m2 is distributed on two floors. On the first floor there is a sunny living room with black leather sofa, a 42 TV with DVD and satellite, totally opened at a fully equipped kitchen with dishwasher, oven, microwave and refrigerator; 1 toilett. Gym with jacuzzi (hot water, not available, just cold water), exercise bike and background music, shower and toilet; and finally a double room with bunk beds of 90x200cm. On the second floor there are a matrimonial bedroom/suite (150x190cm) (+ sofa bed) with hidromassage shower and tub, a double room (2 single beds of 90x190cm); a matrimonial room (135x190cm); This floor has a large terrace from where to enjoy the wonderful views that villa Cristina offers. 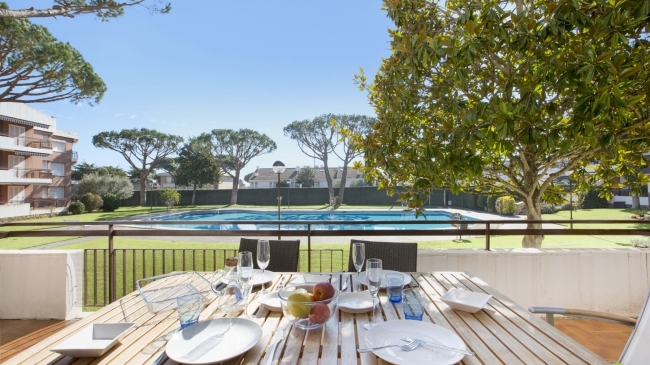 In the exterior area you can enjoy of a garden area with a swimming pool size 10x4 with a qualified part for the little ones (shallow depth). Optional air conditioning (not included. Extra price for using it: 50 € / week). Free Wifi Connection. Villa Ibicenca is an unmistakable stylish house where the white predominance and a distinctive architecture move us to the Balearic Island. 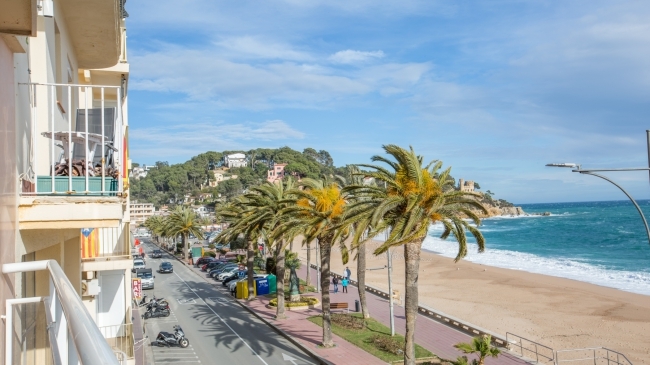 8 Km from the centre of Tossa de Mar ( 6 Km from the centre of Lloret de Mar). 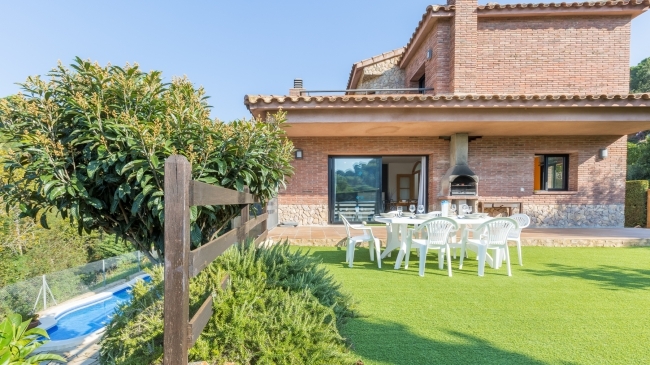 Located in the quiet residential area of Font de Sant Llorenç on a plot of 750m2 and 130m2 habitable area, it has a capacity for 6 people and is distributed on two different floors. The ground floor has a bedroom with a double bed of 135x190cm and two double rooms with single beds 135x190cm, all with access to the terrace and garden; and two bathrooms with bathtubs. Upstairs there is a living room with access to the terrace and equipped with a TV and fireplace, a kitchenette with microwave, oven, fridge freezer,dishwasher; there is also a toilet and laundry room. The outside zone consists of a pool, barbecue area, private garden, parking and playground for children. Wi-fi connection optional. Extra price for using: 50€/week. The pictures of the beach do not correspond to the view from the house. They are of Cala Canyelles, the closest beach to the villa. Cala Canyelles is a pretty stretch of the Costa Brava's coast with 500m of the characteristic coarse white sand beach of the area. Umbrellas and deck chairs are available to rent as well as activities like pedal boats, parasailing, water- skiing and canoeing. Also you can taste the Mediterranean food, fish and paellas, in the restaurant placed on the beach. 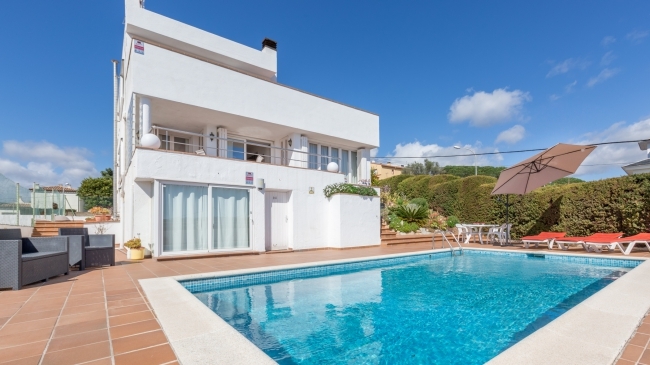 House (200 m2 + 800 m2 for plot) located 3,5 km from the beach Cala Canyelles and 6 km from the centre of Tossa de Mar, (4 Km from the centre of Lloret de Mar), in the quiet residencial area of Serra Brava. 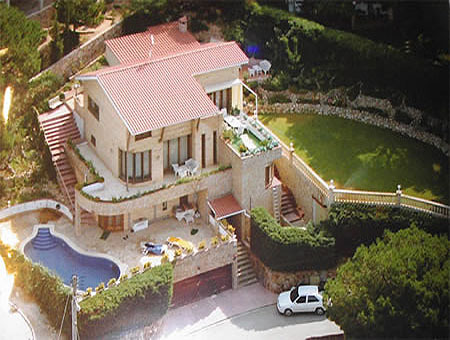 Villa Salu is a cozy home for 14 people distributed over 2 floors. On the ground floor there is a bright and spacious living room with a TV satellite (french channels, international channels), a kitchen equipped with microwave, oven, vitroceramic cooktop, coffee machine and fridge freezer. As well as 2 double rooms (135x190cm;150x190cm), one double bedroom (90x190cm) and a bathroom with a bathtub. The second floor consists of 2 double bedrooms and 1 double room suite (bathroom with tub) (135x190cm) and the other with 2 single beds (90x190cm), a lounge with 1 double sofa bed and a bathroom with shower, plus a large terrace. Salu village also has a private pool, barbecue area with table of work, outdoor toilet, outdoor shower, and access (10m) to a community park with tennis, soccer, volleyball and basketball courts. Optional heating. (not included. Extra price for using it: 50 euro/week). Free wifi connection. The pictures of the beach do not correspond to the view from the house. They are of Cala Canyelles, the closest beach to the villa. Cala Canyelles is a pretty stretch of the Costa Brava's coast with 500m of the characteristic coarse white sand beach of the area. Umbrellas and deck chairs are available to rent as well as activities like pedal boats, parasailing, water- skiing and canoeing. Also you can taste the Mediterranean food, fish and paellas, in the restaurant placed on the beach. 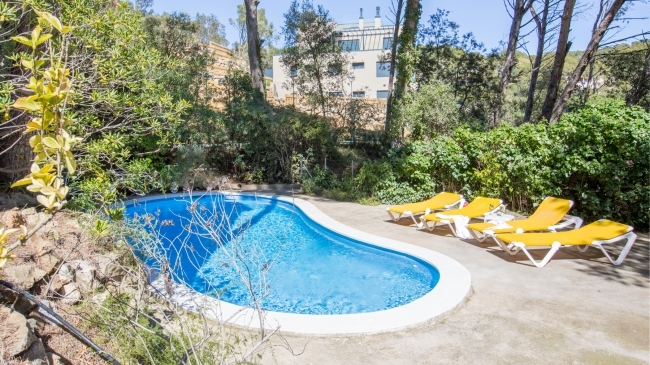 Simple house (100 m2 + 625 m2 for plot) located in Lloret de Mar, 8,5 km from the beach and the centre of Lloret, in the residencial area of Aiguaviva Park. It has 3 double bedrooms (2 double beds; 2 single beds) + 1 single bedroom,a living-room (TV), a kitchen (microwave, washing machine, dishwasher), bathroom. 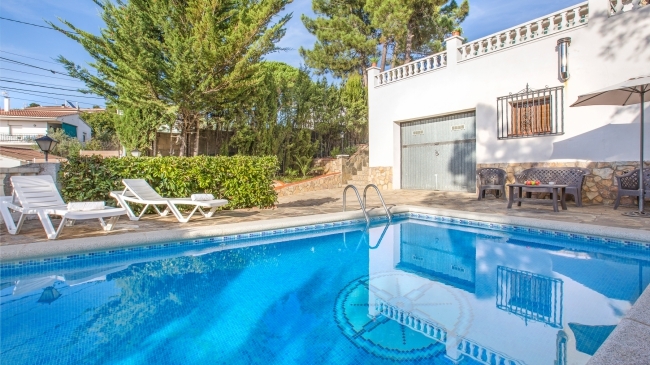 Private pool (7 x 4 m) with outside shower and barbecue. Parking. 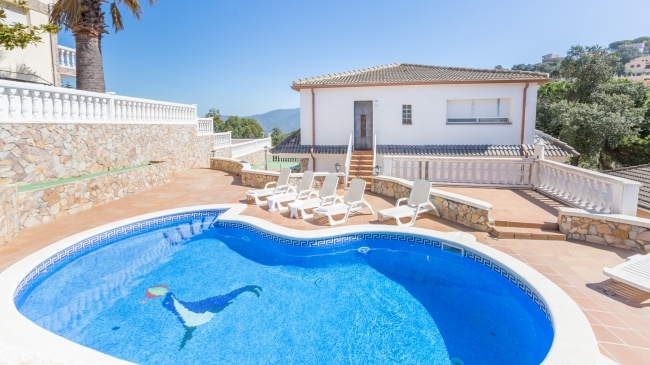 Single simple house located in Lloret de Mar, 7 km from the beach and from the centre of Lloret, in the quiet housing development of Lloret Blau. It has 2 double bedrooms (1 double bed 135x190cm; 2 single beds 90x190cm) + 1 single bedroom 90x190cm, a living-room (TV; fire place), sofa-bed, a kitchen, 1 bathroom. Private pool (4 x 8 m) and terrace. Barbecue. Parking (2 cars). 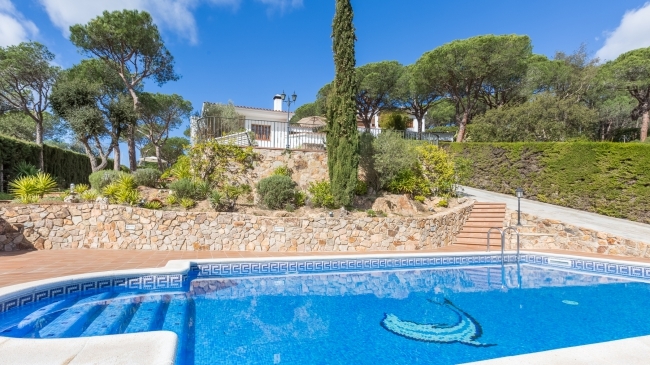 Villa Marian is a beautiful house of 130m2 on a plot of 400m2 in Lloret Residencial neighborhood, 8 km from the beach and the town center. 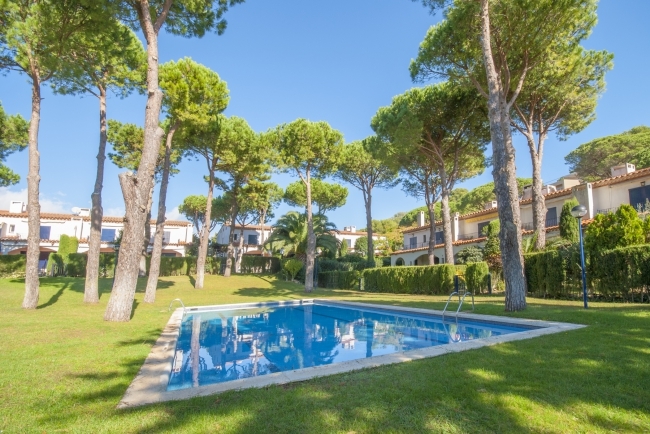 This villa has two bedrooms with two single beds each (2 of 90x190cm + 2 of 80x180cm) and a double bedroom suite (150x200cm) with shower, plus a bathroom with shower as well. The living room, with access to the swimming pool, include TV, DVD, satellite and hifi. The kitchen is equipped with microwave, dishwasher, washing machine, oven and fridge freezer. The outer zone is formed by a grass area and a pool of 8x4m size.